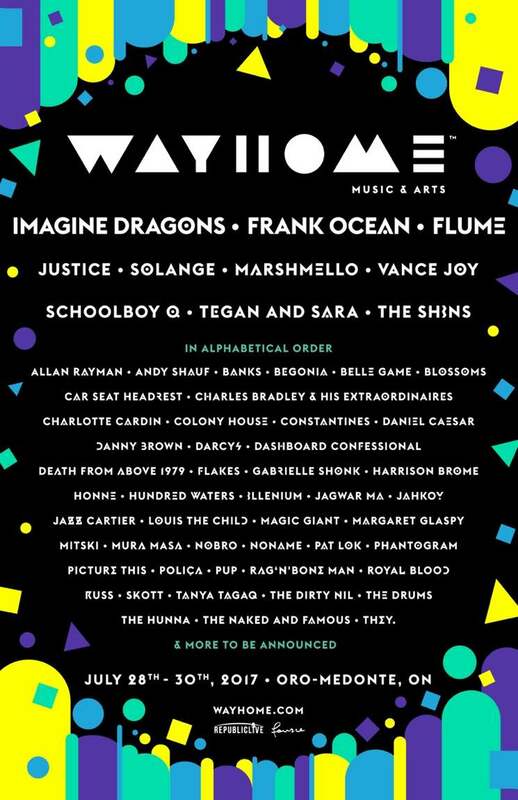 Republic Live, organizers of WayHome Music and Arts Festival are pleased to announce the 2017 line-up with headliners Imagine Dragons, Frank Ocean, and Flume. Music fans will once again have the opportunity to see some of the greatest musical acts, across all genres, share a stage at the custom-designed camping and festival grounds, Burl’s Creek Event Grounds, in Oro-Medonte from July 28-30. Indie-pop rock, Grammy Live Performance Award winners, Imagine Dragons, critically acclaimed, cutting edge R&B rap artist Frank Ocean, and double platinum 2017 Grammy award winning Australian producer Flume will headline the main stage. The 2017 headliners will be joined by France’s electronic-duo Justice, chart topping singer-songwriter of the standout 2016 release “A Seat at the table” and Grammy award winner Solange, one of the hottest electronic music DJs and producers Marshmello, Grammy nominated rapper Schoolboy Q, multi-platinum Australian singer-songwriter Vance Joy, Canadian indie-pop and multiple Juno nominees Tegan and Sara, power alt-pop tunesmiths The Shins, whose much anticipated fifth studio album will be soon released, and many more. Full-event passes will go on-sale Friday, February 17, 2017 at 10 A.M. EST only at www.wayhome.com – with Tier 1 General Admission passes priced at $229.99 and VIP passes priced at $599.99. WayHome Music & Arts, produced by Republic Live, is a three-day music and arts festival held at the custom-designed camping festival grounds, Burl’s Creek. In it’s inaugural year, WayHome featured headliners Neil Young, Sam Smith, Kendrick Lamar, along with Alt-J, Modest Mouse, Hozier and many more. In it’s second year, WayHome Music and Arts 2016 featured LCD Soundsystem, Arcade Fire and The Killers, in addition to performances by Major Lazer, M83, HAIM, Metric, Chvrches, Ray LaMontagne, and 60+ more artists. The festival offers multiple stages, a variety of late-night spectacles and experiences, international and local cuisine, an on-site locally produced farmers market, original art installations – past artists include internally acclaimed artist such as; DoLab and Angus Watt, and more to 40,000+ fans over the course of the weekend. WayHome Music and Arts was recently awarded the New Kid on the Block (Best New Festival) award and was nominated for Major Festival of the Year at the 2016 Canadian Music Awards. Save the date for 2017 as WayHome will be taking place July 28th – 30th 2017 at Burl’s Creek Event Grounds. www.wayhome.com. Republic Live is a Canadian-owned live entertainment company founded in 2011, with offices in Toronto, Ontario and Nashville, Tennessee. Republic Live takes pride in creating world-class, fan-centric, time of your life experiences. The company works with a multitude of partners on a variety of platforms to create unique experiences for fans, artists, industry partners and sponsors. Republic Live’s two flagship events are Boots and Hearts Music Festival, Canada’s largest camping and country music festival and WayHome Music & Arts Festival, a kaleidoscope of sound, smell, colour, and spectacle. Fource Entertainment Canada is a company founded in 2016 with a mission to deliver the best music and experiences to as many fans as possible across the country in partnership with leading artists, partners and venues. Fource’s heritage stems from a group of people who have been part of the creation, evolution and management of some of Canada’s premiere concerts, festivals and branded events over the past 20 years. Fource is the exclusive talent booking agency for the 2017 editions of WayHome, Boots & Hearts, NXNE Port Lands, and The Big Feastival Canada festivals.